★★★★★★Poems in English and Spanish by Jane Medina. 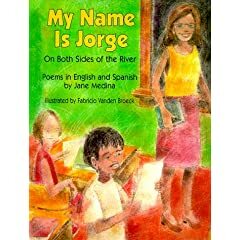 A very nice book with poems (either side by side or one after the other) in English and Spanish. I really liked this book - one of the poems is called "The Busy Street"
Another book I would recommend, it tells of having to try to "make the grade" in a new school, with a new language, when you are used to being the "smart kid". Posted in Book Reviews, Book, , Movie, Music, and Television Reviews. Tags: book reviews, Children books, cultural on January 29, 2008 by MzEllen.